Objective To determine the availability of data on overall survival and quality of life benefits of cancer drugs approved in Europe. Setting Publicly accessible regulatory and scientific reports on cancer approvals by the European Medicines Agency (EMA) from 2009 to 2013. Main outcome measures Pivotal and postmarketing trials of cancer drugs according to their design features (randomisation, crossover, blinding), comparators, and endpoints. Availability and magnitude of benefit on overall survival or quality of life determined at time of approval and after market entry. Validated European Society for Medical Oncology Magnitude of Clinical Benefit Scale (ESMO-MCBS) used to assess the clinical value of the reported gains in published studies of cancer drugs. Results From 2009 to 2013, the EMA approved the use of 48 cancer drugs for 68 indications. Of these, eight indications (12%) were approved on the basis of a single arm study. At the time of market approval, there was significant prolongation of survival in 24 of the 68 (35%). The magnitude of the benefit on overall survival ranged from 1.0 to 5.8 months (median 2.7 months). At the time of market approval, there was an improvement in quality of life in seven of 68 indications (10%). Out of 44 indications for which there was no evidence of a survival gain at the time of market authorisation, in the subsequent postmarketing period there was evidence for extension of life in three (7%) and reported benefit on quality of life in five (11%). Of the 68 cancer indications with EMA approval, and with a median of 5.4 years’ follow-up (minimum 3.3 years, maximum 8.1 years), only 35 (51%) had shown a significant improvement in survival or quality of life, while 33 (49%) remained uncertain. Of 23 indications associated with a survival benefit that could be scored with the ESMO-MCBS tool, the benefit was judged to be clinically meaningful in less than half (11/23, 48%). Conclusions This systematic evaluation of oncology approvals by the EMA in 2009-13 shows that most drugs entered the market without evidence of benefit on survival or quality of life. At a minimum of 3.3 years after market entry, there was still no conclusive evidence that these drugs either extended or improved life for most cancer indications. When there were survival gains over existing treatment options or placebo, they were often marginal. No recent studies have systematically examined the evidence base and magnitude of benefit for cancer drugs approved by the European Medicines Agency (EMA).272829 Available data from the US show that only a small proportion of cancer treatments approved by the US Food and Drug Administration (FDA) unequivocally show benefits on survival or quality of life.30 The applicability of this evidence to the European context, however, is not clear. 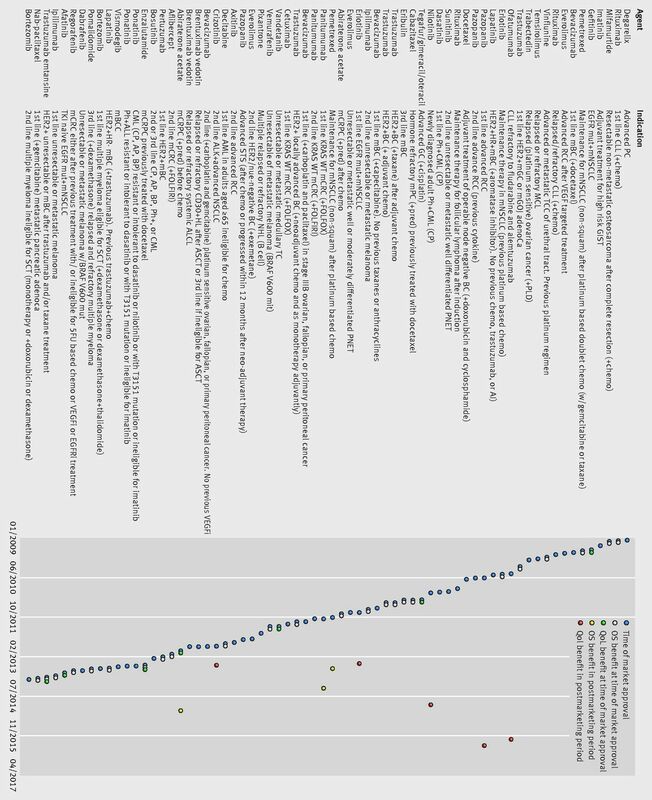 Recent FDA-EMA comparisons show differences in regulatory decisions, route of approval, and availability of cancer drugs that could have important implications for clinical practice and patient safety.3132333435 In particular, regulatory provisions for expediting drug development and approval differ between the US and the EU,32 with EU regulation being more restrictive in scope.36 This could lead to divergent outcomes between the two regions. The proportion of cancer drugs approved by the EMA without any demonstrable benefits on survival or quality of life is not known. In addition, whether treatments approved without evidence of benefit on survival are subsequently shown to improve survival or quality of life in postmarketing studies has not been characterised. We sought to systematically evaluate the evidence base for all new drugs and new indications for the treatment of solid tumours and haematological malignancies approved by the EMA in the five year period 2009-13. We determined the proportion of drugs with demonstrable benefit on survival or quality of life over available treatment options or placebo, both at time of approval and in the postmarketing period. In addition, we used a validated scale to evaluate the magnitude of benefit of drugs in our sample showing a significant improvement on survival in the treatment of solid cancers. We distinguished between different types of regulatory approval. A “first marketing authorisation” indicates that the drug is a new active substance, approved onto the EU market for the first time. An “extension” to a marketing authorisation is when a marketed drug is approved for use in a new patient population, new combination, new line of treatment, or new type of cancer. By law, a “regular marketing authorisation” should be based on comprehensive evidence of quality, safety, and efficacy. “Conditional marketing authorisations” can be granted for drugs intended to treat patients with seriously debilitating or life threatening diseases and are expected to fulfil an unmet medical need. Conditional approvals are granted on the basis of less comprehensive data than required for a regular marketing authorisation, and companies are required to generate additional evidence in the postmarketing period.36 “Orphan drug” designation is granted for the treatment of rare cancers. We also categorised indications according to cancer site and stage of disease (specifically whether treatments were to be used in a curative or non-curative setting). To determine the availability of evidence on overall survival and quality of life gains at time of market approval for the drugs in our cohort, we manually searched the EMA website to identify the relevant European Public Assessment Reports (EPARs). EPARs are official regulatory documents in the public domain that summarise the evidence base for a new drug or new indication and provide a justification for the EMA’s decision to grant a marketing authorisation or extension to the marketing authorisation. Clinical trial data supporting approval of each of the unique indications were retrieved from the EPARs. We included only data from those studies identified by the EMA as the main, or “pivotal,” studies supporting approval. To determine whether drugs that did not show any survival gain at the time of approval were subsequently confirmed to improve survival or quality of life in the postmarketing period, we searched PubMed for randomised controlled trials reporting these outcomes for the relevant indications. Our search strategy included the drug name, approved indication, and search terms for the endpoints of interest (overall survival or quality of life or QoL or HRQoL) (fig B in appendix). We identified randomised controlled trials using the Cochrane Collaboration sensitivity and precision maximising search strategy for identifying randomised trials.37 When possible, we cross checked search results against the European Clinical Trials Database (EudraCT) and the US National Library of Medicine database of clinical trials (ClinicalTrials.gov). Our latest search was on 31 March 2017, which allowed for at least 3.3 years for the completion and publication of clinical studies in the postmarketing period (median 5.4 years, maximum 8.1 years). For those drugs associated with an overall survival gain at the time of approval or in the postmarketing period, we used the European Society for Medical Oncology’s (ESMO) Magnitude of Clinical Benefit Scale (ESMO-MCBS) to assess the clinical value of these gains as reported in published studies.38 The ESMO-MCBS scale is a tool for evaluating the clinical benefit of new treatments for solid tumours to facilitate the presentation of clear and unbiased statements regarding the relative clinical benefit of new treatments. Three investigators (AP, EP, and EG) independently extracted data on and descriptively analysed the following trial features: characteristics of the participant population, study design (randomisation, crossover from experimental to control group, and blinding of investigators and participants), experimental and control groups, enrolment, primary and secondary endpoints, magnitude of benefit on survival and quality of life, and narrative interpretation of the findings. We classified comparators as active (in trials comparing drugs A versus B), add on (in trials comparing drugs A+B versus B alone), placebo, or none. Investigators cross checked each other’s data extraction. Difficulties or disagreements in interpretation were resolved by discussion and consensus among the three lead investigators (CD, HN, and AA). All data were also checked by the principal investigator (CD). We judged that a drug had shown a survival benefit in its approved indication if, as reported in the EPAR or study publication, overall survival was the primary or secondary endpoint in a randomised controlled trial, and the difference in survival between the experimental and control arms was significant according to a prespecified statistical analysis. If an analysis was described as “exploratory” we considered it to be a post hoc analysis. Post hoc analyses (in which the hypotheses being tested were not specified before examination of the data) were accepted if the EMA specifically determined that these analyses provided evidence of a survival benefit. If a published study reporting results of a pivotal trial conflicted with the EMA’s assessment or other information contained in an EPAR, we made a determination consistent with the EPAR, unless the published study reported an updated analysis. We considered that a drug had shown a benefit on quality of life in its approved indication when a significant difference was reported for an item or subscale derived from a validated quality of life instrument, even in the absence of a significant benefit with respect to the global score. Our scoring was limited to drugs for solid tumours as the ESMO scales are not intended for evaluation of drugs to treat haematological malignancies.38 Two investigators (AA and CD) independently graded individual trials based on published papers that reported a significant difference in overall survival (as a prespecified primary or secondary study endpoint) using the most recent version of the ESMO-MCBS evaluation forms.39 There was complete agreement between the two investigators in the scoring. As per the established ESMO methods, each score was assigned based on the magnitude of the absolute survival gain and the lower limit of the 95% confidence interval of the hazard ratio, and only significant changes in toxicity or quality of life parameters were used to modify the grades. Only scores of A or B (for treatments of curative intent), or 5 or 4 (for treatments used in the non-curative/palliative setting) are defined as clinically meaningful according to the ESMO framework. Seventeen drugs were approved for treatment of haematological malignancies and 51 for treatment of solid tumours. Of these 51, 12 (24%) were for breast cancer, seven (14%) for lung cancer, five for bowel cancer, and five (10%) for prostate cancer. Of the 17 drugs approved for treatment of haematological malignancies, four (24%) were for chronic myeloid leukaemia, three (18%) for multiple myeloma, and three (18%) for chronic lymphocytic leukaemia. Most drugs (61/68, 90%) were approved for use in a non-curative setting (table 1⇑). Overall, 72 clinical trials supported the approval of 68 novel drug uses. Only 18 of the 68 (26%) were supported by a pivotal study powered to evaluate overall survival as the primary outcome (table 2⇓ and table B in appendix). Survival was evaluated as the primary study endpoint in none of the 10 conditionally authorised uses and in only one of the 11 (9%) with an orphan designation. Overall survival was evaluated as a primary study endpoint in less than a third (18/58, 31%) of all drug indications granted regular marketing authorisation. The remaining drug indications were supported by trials that evaluated a surrogate measure as the primary study outcome (table 2⇑ and table B in appendix). This included progression-free survival for 31 (46%); response rate (including cytogenetic, haematological, and molecular response rates for haematological indications) for 11 (16%); disease-free survival for four (6%); with time to progression, event-free survival, relapse-free survival, and testosterone concentrations accounting for the remainder (4/68, 6%). Just over half (37/68, 54%) of all drug indications had a supporting pivotal trial evaluating quality of life, but results were reported for only 35. None of the pivotal trials assessed quality of life as a primary endpoint (table 2⇑). Of 68 drug indications, 60 (88%) were supported by at least one randomised controlled trial, while eight of 68 (12%) were approved solely on the basis of a single arm study (6/10 indications granted a conditional marketing authorisation and 2/58 granted a regular marketing authorisation) (table 2⇑ and table B in appendix). Most (6/8, 75%) authorised uses supported by uncontrolled studies were also orphan designations. On the other hand, more than half of the orphan drugs in our cohort (7/11, 64%) were approved on the basis of a randomised trial. At time of market approval, according to the EPARs, there was significant prolongation of survival in just over a third (24/68, 35%) of all drug indications (including 3/17 drugs to treat haematological malignancies and 21/51 drugs to treat solid tumours). There were gains in survival for seven compared with an active comparator, eight compared with placebo, one compared with best supportive care, and eight as add on treatment. The magnitude of the overall survival benefit ranged from 1.0 to 5.8 months (median 2.7 months) (fig 1⇓). For the 44 (65%) remaining drug indications, there was no conclusive evidence at time of market authorisation that the drugs offered survival benefits, either as add on treatment or compared with placebo or existing treatment options in their authorised use. There was a significant improvement in quality of life over the control arm in only seven of the 68 (10%) authorised drug indications. Five of these were drug indications for which there was no survival gain at the time of market authorisation, giving a total of 29 of 68 (43%) that did show improvements in either quantity or quality of life at time of market entry. The remaining 39 (57%) drugs had shown no improvement in survival or quality of life over active treatment, placebo, or as add on treatment. Eleven were evaluated against an active comparator, and 10 of these had comparable efficacy with respect to survival, although in most cases survival data were immature. Twenty were evaluated against placebo or as add on treatment and showed no gains in survival or quality of life. Eight were approved on the basis of a single arm trial. Of the 44 drug indications that did not show a survival benefit at time of approval, and with a median of 5.4 years’ follow-up (minimum of 3.3 years and maximum of 8.1 years), three (7%) were subsequently shown to extend life after market entry and five (11%) were associated with some improvements in quality of life (fig 2⇓). For all three drug indications with a reported survival gain in the postmarketing period, evidence came from updated analyses of the pivotal studies supporting initial marketing authorisation, and all had been granted regular marketing approval. None of the 10 drugs granted conditional marketing authorisation were subsequently shown to improve quantity or quality of life. One of 68 authorised uses judged by the EMA to extend life at time of market authorisation failed to show such a benefit on longer follow-up according to the published report.41 Thus, with a minimum 3.3 years’ follow-up, in 26 of the 68 (38%) authorised drug indications there was a survival gain (including three of the seven drugs approved for use in a curative setting). For the five drug indications with a reported improvement in quality of life, evidence came from new studies in the same indicated population with the exception of nilotinib, for which a published paper42reporting the pivotal study described quality of life gains not reported in the EPAR. Box 2 lists those drugs not shown to extend life, but which were associated with a quality of life benefit with a median of 5.4 years’ follow-up. Table 3⇓ shows the ESMO-MCBS scores for all the drugs to treat solid tumours that showed benefit on overall survival by the time of our study cut off. After a median of 5.4 years’ follow-up 26 drug indications were associated with a survival gain, but three of these were for haematological cancers, leaving a total of 23 to which the ESMO scale could be applied. Of these 23 drugs, 11 (48%) reached the ESMO threshold for a meaningful survival benefit; eight out of 20 (40%) for use in the non-curative setting and all three treatments with curative intent. Among 68 cancer drug indications approved by the EMA in the period 2009-13, and with a median of 5.4 years’ follow-up, only 35 (51%) were associated with a significant improvement in survival (26/35) or quality of life (9/35) over existing treatment options, placebo, or as add on treatment. 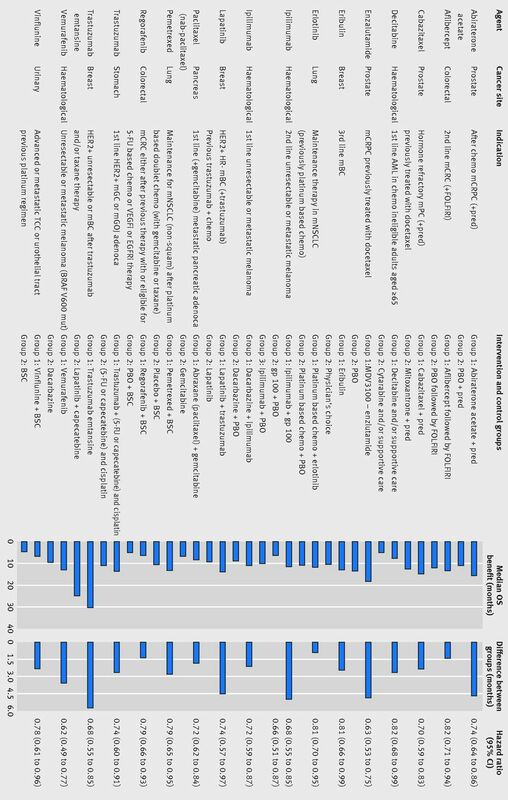 Only two of the 26 drugs shown to extend life also showed benefits on quality of life, and 33 (49%) had not shown any improvement on survival or quality of life (fig 2⇑). Of the 23 drugs with a survival benefit that could be scored with the validated ESMO-MCBS tool, only 11 (48%) were judged to offer a clinically meaningful benefit. This systematic evaluation of oncology drug approvals by the EMA in 2009-13 shows that most of the drugs (39/68, 57%) entered the market without evidence of improved survival or quality of life. At a minimum 3.3 years after market entry, there was still no conclusive evidence that 33 of these 39 cancer drugs either extended or improved life. Our findings suggest it is extremely rare for new studies or follow-up analyses of pivotal trials in the postmarketing period to report results confirming that new cancer drugs have a positive impact on the two most important outcomes for patients—survival and quality of life. When survival gains over existing treatment options or placebo were shown, they were often marginal and judged to be clinically meaningful in less than half (11/23, 48%) of all cases. Apolone and colleagues27 evaluated the evidence base for new cancer drugs approved by the EMA in the period 1995-2004. In that 10 year period the EMA authorised 14 anticancer drugs for 27 indications. An important difference between their earlier study and the present one is that the earlier cohort includes only drugs to treat solid tumours. Nevertheless, our findings indicate some improvements in the quality of the evidence base supporting new oncology drugs. For example, drug uses authorised in the study period 2009-13 were more likely to be supported by trials that included overall survival as a primary endpoint (26% v 8%), and by randomised trials (88% v 66%). There has been a substantial increase in the number of approved treatments for solid tumours compared with the earlier period—an average of 12 a year for 2009-20 compared with three a year for 1995-2004. In contrast with recent studies focusing on a subset of oncology drug approvals in Europe,3233 we included all authorised oncology indications regardless of route of approval and systematically analysed survival and quality of life benefits. We also relied exclusively on evidence generated from randomised controlled trials. We did not therefore accept mathematical models considered by health technology assessment bodies such as the National Institute for Health and Care Excellence.81 There is continuing debate around the validity of simulation models that extrapolate findings from short term trials.8283 Our analysis is the first to investigate whether drugs that did not show a survival benefit at the time of approval in Europe are subsequently shown to improve survival or quality of life in follow-up randomised controlled trials once drugs are on the market. Secondly, we did not consider the appropriateness of clinical trial design, including whether a treatment administered in the control arm of a study was optimal or even informative. This is an important study limitation, which again means we might have overestimated the benefits offered by the drugs in our sample. For example, the control arm of the pivotal trial to support approval of ipilimumab for metastatic melanoma was an experimental treatment. Similarly, the pivotal trial to support lapatinib in combination with trastuzumab for patients with metastatic breast cancer used lapatinib monotherapy as the comparison—a treatment acknowledged in the EPAR to be “without established efficacy.”86 Although this trial design failed to isolate the effects of the test drug, the EMA nevertheless concluded that the reported benefit in survival was clinically relevant and could be attributed to the combination. Thirdly, our ESMO ratings share the limitations of the published studies on which they are based. For example, the magnitude of clinical benefit shown in a particular trial could be inflated by the choice of an inappropriate comparator or treatment in the control arm that does not represent best standard of care.38 Several maintenance therapy trials for metastatic non-small cell lung cancer, for example, have been criticised for flawed study designs that systematically result in substandard care in the control arms.87 In the case of lapatinib combined with tratuzumab, the pivotal study was scored 4 on the basis of a 4.5 month survival gain over lapatinib monotherapy (with no established efficacy). Fourthly, our findings do not reflect the totality of the evidence base for a specific authorised indication as we did not take account of studies with negative results for the same drug indication if they were not reported as pivotal studies in the EPAR, nor did we take account of the fact that studies with positive results for a particular indication could conflict with negative findings from other studies in the same indicated patient population. The EMA and other drug regulatory agencies should reconsider when, and to what extent, it is appropriate to approve new cancer drugs on the basis of surrogate endpoints. Furthermore, when gains in survival and quality of life are shown, these gains should be meaningful to patients and clinicians. Among 68 cancer drug indications approved by the EMA in the period 2009-13, and with a median of 5.4 years’ follow-up, only 35 (51%) were associated with significant improvement in survival or quality of life over alternative treatment options, placebo, or as add on treatment. For 33 (49%), uncertainty remains over whether the drugs extend survival or improve quality of life. Of the 23 drugs with a survival benefit that could be scored with the validated ESMO-MCBS tool, only 11 (48%) were judged to offer a clinically meaningful benefit. Most new oncology drugs authorised by the EMA in 2009-13 came onto the market without clear evidence that they improved the quality or quantity of patients’ lives, and, when survival gains over available treatment alternatives were shown, they were not always clinically meaningful. Little new information to guide patients, their treating clinicians, or decisions about whether or not to pay for treatments was generated in the postmarketing period. This situation has negative implications for patients and public health.1993 When expensive drugs that lack clinically meaningful benefits are approved and paid for within publicly funded healthcare systems, individual patients can be harmed, important societal resources wasted, and the delivery of equitable and affordable care undermined. Contributors: CD conceived the study and acquired funding. CD, HN, and AA designed the study. EP, AP, and EG undertook data extraction and some analysis. CD undertook the primary analysis with input from HN and AA. CD drafted the first manuscript, with HN and AA contributing to subsequent iterations. All authors provided critical input on the manuscript and approved the final version for publication. CD is guarantor. Funding: This study was supported by project funding from Health Action International. The study funder did not have any role in the study design; the collection, analysis, and interpretation of data; the writing of the report; or the decision to submit the article for publication. CD is a member of Health Action International Europe Members Association. EP is a member of Health Projects for Latvia, which is affiliated to Health Action International, and a board member of the Health Action International Europe Association. All authors had full access to all of the data in the study and can take responsibility for the integrity of the data and the accuracy of the data analysis. Competing interests: All authors have completed the ICMJE uniform disclosure at www.icmje.org/coi_disclosure.pdf and declare: EG, AP, and EP were supported by project funding from Health Action International; no financial relationships with any organisations that might have an interest in the submitted work in the previous three years; no other relationships or activities that could appear to have influenced the submitted work. Transparency: The lead author affirms that this manuscript is an honest, accurate and transparent account of the study being reported; that no important aspects of the study have been omitted; and that any discrepancies from the study as planned have been explained. Peppercorn JM, Smith TJ, Helft PR, et al. American Society of Clinical Oncology. American society of clinical oncology statement: toward individualized care for patients with advanced cancer. J Clin Oncol2011;359:755-60. doi:10.1200/JCO.2010.33.1744. pmid:21263086. Tannock IF, Amir E, Booth CM, et al. Relevance of randomised controlled trials in oncology. Lancet Oncol2016;359:e560-7. doi:10.1016/S1470-2045(16)30572-1. pmid:27924754. Wilson MK, Collyar D, Chingos DT, et al. Outcomes and endpoints in cancer trials: bridging the divide. Lancet Oncol2015;359:e43-52. doi:10.1016/S1470-2045(14)70380-8. pmid:25638556. Amir E, Seruga B, Kwong R, Tannock IF, Ocaña A. Poor correlation between progression-free and overall survival in modern clinical trials: are composite endpoints the answer?Eur J Cancer2012;359:385-8. doi:10.1016/j.ejca.2011.10.028. pmid:22115991. Blumenthal GM, Karuri SW, Zhang H, et al. Overall response rate, progression-free survival, and overall survival with targeted and standard therapies in advanced non-small-cell lung cancer: US Food and Drug Administration trial-level and patient-level analyses. J Clin Oncol2015;359:1008-14. doi:10.1200/JCO.2014.59.0489. pmid:25667291. Booth CM, Eisenhauer EA. Progression-free survival: meaningful or simply measurable?J Clin Oncol2012;359:1030-3. doi:10.1200/JCO.2011.38.7571. pmid:22370321. Piccart M, Hortobagyi GN, Campone M, et al. Everolimus plus exemestane for hormone-receptor-positive, human epidermal growth factor receptor-2-negative advanced breast cancer: overall survival results from BOLERO-2. Ann Oncol2014;359:2357-62. doi:10.1093/annonc/mdu456. pmid:25231953. Prasad V, Kim C, Burotto M, Vandross A. The Strength of Association Between Surrogate End Points and Survival in Oncology: A Systematic Review of Trial-Level Meta-analyses. JAMA Intern Med2015;359:1389-98. doi:10.1001/jamainternmed.2015.2829. pmid:26098871. Saad ED, Katz A, Buyse M. Overall survival and post-progression survival in advanced breast cancer: a review of recent randomized clinical trials. J Clin Oncol2010;359:1958-62. doi:10.1200/JCO.2009.25.5414. pmid:20194852. Wilkerson J, Fojo T. Progression-free survival is simply a measure of a drug’s effect while administered and is not a surrogate for overall survival. Cancer J2009;359:379-85. doi:10.1097/PPO.0b013e3181bef8cd. pmid:19826357. Miller K, Wang M, Gralow J, et al. Paclitaxel plus bevacizumab versus paclitaxel alone for metastatic breast cancer. N Engl J Med2007;359:2666-76. doi:10.1056/NEJMoa072113. pmid:18160686. Gutman SI, Piper M, Grant MD, et al. Progression-Free Survival: What Does It Mean for Psychological Well-Being or Quality of Life? Rockville (MD), 2013. Ciani O, Davis S, Tappenden P, et al. Validation of surrogate endpoints in advanced solid tumors: systematic review of statistical methods, results, and implications for policy makers. Int J Technol Assess Health Care2014;359:312-24. doi:10.1017/S0266462314000300. pmid:25308694. Davis C. Drugs, cancer and end-of-life care: a case study of pharmaceuticalization?Soc Sci Med2015;359:207-14. doi:10.1016/j.socscimed.2014.12.007. pmid:25533871. Fojo T, Grady C. How much is life worth: cetuximab, non-small cell lung cancer, and the $440 billion question. J Natl Cancer Inst2009;359:1044-8. doi:10.1093/jnci/djp177. pmid:19564563. Ocana A, Tannock IF. When are “positive” clinical trials in oncology truly positive?J Natl Cancer Inst2011;359:16-20. doi:10.1093/jnci/djq463. pmid:21131576. Saltz LB. Progress in cancer care: the hope, the hype, and the gap between reality and perception. J Clin Oncol2008;359:5020-1. doi:10.1200/JCO.2008.17.6198. pmid:18794538. Aggarwal A, Fojo T, Chamberlain C, Davis C, Sullivan R. Do patient access schemes for high-cost cancer drugs deliver value to society?-lessons from the NHS Cancer Drugs Fund. Ann Oncol2017;359:1738-50. doi:10.1093/annonc/mdx110. pmid:28453615. Booth CM, Cescon DW, Wang L, Tannock IF, Krzyzanowska MK. Evolution of the randomized controlled trial in oncology over three decades. J Clin Oncol2008;359:5458-64. doi:10.1200/JCO.2008.16.5456. pmid:18955452. Fojo T, Mailankody S, Lo A. Unintended consequences of expensive cancer therapeutics—the pursuit of marginal indications and a me-too mentality that stifles innovation and creativity: the John Conley Lecture. JAMA Otolaryngol Head Neck Surg2014;359:1225-36. doi:10.1001/jamaoto.2014.1570. pmid:25068501. Kantarjian HM, Fojo T, Mathisen M, Zwelling LA. Cancer drugs in the United States: Justum Pretium--the just price. J Clin Oncol2013;359:3600-4. doi:10.1200/JCO.2013.49.1845. pmid:23650428. Light DW, Lexchin J. Why do cancer drugs get such an easy ride?BMJ2015;359:h2068. doi:10.1136/bmj.h2068. pmid:25908437. Booth CM, Del Paggio JC. Approvals in 2016: questioning the clinical benefit of anticancer therapies. Nat Rev Clin Oncol2017;359:135-6. doi:10.1038/nrclinonc.2017.18. pmid:28218259. Dangoor A, Joffe J, Januszewski A, Mansi J, Cunningham D, Selby P. 17 other authors and members of the Association of Cancer Physicians, UK. The Association of Cancer Physicians responds to “Cancer drugs, survival, and ethics”. BMJ2016;359:i6487. https://doi.org/10.1136/bmj.i5792. doi:10.1136/bmj.i6487 pmid:27920029. Naci H, Cylus J, Vandoros S, Sato A, Perampaladas K. Raising the bar for market authorisation of new drugs. BMJ2012;359:e4261. doi:10.1136/bmj.e4261. pmid:22872693. Apolone G, Joppi R, Bertele’ V, Garattini S. Ten years of marketing approvals of anticancer drugs in Europe: regulatory policy and guidance documents need to find a balance between different pressures. Br J Cancer2005;359:504-9. doi:10.1038/sj.bjc.6602750. pmid:16136026. Garattini S, Bertele V. Efficacy, safety, and cost of new anticancer drugs. BMJ2002;359:269-71. doi:10.1136/bmj.325.7358.269 pmid:12153927. Pignatti F, Aronsson B, Vamvakas S, et al. Clinical trials for registration in the European Union: the EMEA 5-year experience in oncology. Crit Rev Oncol Hematol2002;359:123-35. doi:10.1016/S1040-8428(02)00009-4 pmid:12007970. Kim C, Prasad V. Cancer Drugs Approved on the Basis of a Surrogate End Point and Subsequent Overall Survival: An Analysis of 5 Years of US Food and Drug Administration Approvals. JAMA Intern Med2015;359:1992-4. doi:10.1001/jamainternmed.2015.5868. pmid:26502403. Hatswell AJ, Baio G, Berlin JA, Irs A, Freemantle N. Regulatory approval of pharmaceuticals without a randomised controlled study: analysis of EMA and FDA approvals 1999-2014. BMJ Open2016;359:e011666. doi:10.1136/bmjopen-2016-011666. pmid:27363818. Hoekman J, Boon WP, Bouvy JC, Ebbers HC, de Jong JP, De Bruin ML. Use of the conditional marketing authorization pathway for oncology medicines in Europe. Clin Pharmacol Ther2015;359:534-41. doi:10.1002/cpt.174. pmid:26080745. Martinalbo J, Bowen D, Camarero J, et al. Early market access of cancer drugs in the EU. Ann Oncol2016;359:96-105. doi:10.1093/annonc/mdv506. pmid:26487583. Tafuri G, Stolk P, Trotta F, et al. How do the EMA and FDA decide which anticancer drugs make it to the market? A comparative qualitative study on decision makers’ views. Ann Oncol2014;359:265-9. doi:10.1093/annonc/mdt512. pmid:24356637. Trotta F, Leufkens HG, Schellens JH, Laing R, Tafuri G. Evaluation of oncology drugs at the European Medicines Agency and US Food and Drug Administration: when differences have an impact on clinical practice. J Clin Oncol2011;359:2266-72. doi:10.1200/JCO.2010.34.1248. pmid:21537038. Official Journal of the European Union. Commission Regulation (EC) No. 507/2006, of 29 March 2006 on the conditional marketing authorisation for medicinal products for human use falling within the scope of Regulation (EC) No 726/2004 of the European Parliament and of the Council, 2006. Cherny NI, Sullivan R, Dafni U, et al. A standardised, generic, validated approach to stratify the magnitude of clinical benefit that can be anticipated from anti-cancer therapies: the European Society for Medical Oncology Magnitude of Clinical Benefit Scale (ESMO-MCBS). Ann Oncol2015;359:1547-73. doi:10.1093/annonc/mdv249. pmid:26026162. ESMO. Magnitude of Clinical Benefit Scale. http://www.esmo.org/Policy/Magnitude-of-Clinical-Benefit-Scale/Scale-Evaluation-Forms. Gianni L, Eiermann W, Semiglazov V, et al. Neoadjuvant and adjuvant trastuzumab in patients with HER2-positive locally advanced breast cancer (NOAH): follow-up of a randomised controlled superiority trial with a parallel HER2-negative cohort. Lancet Oncol2014;359:640-7. doi:10.1016/S1470-2045(14)70080-4. pmid:24657003. Guérin A, Chen L, Ionescu-Ittu R, et al. Impact of low-grade adverse events on health-related quality of life in adult patients receiving imatinib or nilotinib for newly diagnosed Philadelphia chromosome positive chronic myelogenous leukemia in chronic phase. Curr Med Res Opin2014;359:2317-28. doi:10.1185/03007995.2014.944973. pmid:25025755. Shaw AT, Kim DW, Nakagawa K, et al. Crizotinib versus chemotherapy in advanced ALK-positive lung cancer. N Engl J Med2013;359:2385-94. doi:10.1056/NEJMoa1214886. pmid:23724913. Chen G, Feng J, Zhou C, et al. Quality of life (QoL) analyses from OPTIMAL (CTONG-0802), a phase III, randomised, open-label study of first-line erlotinib versus chemotherapy in patients with advanced EGFR mutation-positive non-small-cell lung cancer (NSCLC). Ann Oncol2013;359:1615-22. doi:10.1093/annonc/mdt012. pmid:23456778. Österborg A, Udvardy M, Zaritskey A, et al. Phase III, randomized study of ofatumumab versus physicians’ choice of therapy and standard versus extended-length ofatumumab in patients with bulky fludarabine-refractory chronic lymphocytic leukemia. Leuk Lymphoma2016;359:2037-46. doi:10.3109/10428194.2015.1122783. pmid:26784000. Motzer RJ, Hutson TE, Cella D, et al. Pazopanib versus sunitinib in metastatic renal-cell carcinoma. N Engl J Med2013;359:722-31. doi:10.1056/NEJMoa1303989. pmid:23964934. Fizazi K, Scher HI, Molina A, et al. COU-AA-301 Investigators. Abiraterone acetate for treatment of metastatic castration-resistant prostate cancer: final overall survival analysis of the COU-AA-301 randomised, double-blind, placebo-controlled phase 3 study. Lancet Oncol2012;359:983-92. doi:10.1016/S1470-2045(12)70379-0 pmid:22995653. Ryan CJ, Smith MR, Fizazi K, et al. COU-AA-302 Investigators. Abiraterone acetate plus prednisone versus placebo plus prednisone in chemotherapy-naive men with metastatic castration-resistant prostate cancer (COU-AA-302): final overall survival analysis of a randomised, double-blind, placebo-controlled phase 3 study. Lancet Oncol2015;359:152-60. doi:10.1016/S1470-2045(14)71205-7 pmid:25601341. Van Cutsem E, Tabernero J, Lakomy R, et al. Addition of aflibercept to fluorouracil, leucovorin, and irinotecan improves survival in a phase III randomized trial in patients with metastatic colorectal cancer previously treated with an oxaliplatin-based regimen. J Clin Oncol2012;359:3499-506. doi:10.1200/JCO.2012.42.8201 pmid:22949147.
de Bono JS, Oudard S, Ozguroglu M, et al. TROPIC Investigators. Prednisone plus cabazitaxel or mitoxantrone for metastatic castration-resistant prostate cancer progressing after docetaxel treatment: a randomised open-label trial. Lancet2010;359:1147-54. doi:10.1016/S0140-6736(10)61389-X pmid:20888992. Cortes J, O’Shaughnessy J, Loesch D, et al. EMBRACE (Eisai Metastatic Breast Cancer Study Assessing Physician’s Choice Versus E7389) investigators. Eribulin monotherapy versus treatment of physician’s choice in patients with metastatic breast cancer (EMBRACE): a phase 3 open-label randomised study. Lancet2011;359:914-23. doi:10.1016/S0140-6736(11)60070-6 pmid:21376385. Cappuzzo F, Ciuleanu T, Stelmakh L, et al. SATURN investigators. Erlotinib as maintenance treatment in advanced non-small-cell lung cancer: a multicentre, randomised, placebo-controlled phase 3 study. Lancet Oncol2010;359:521-9. doi:10.1016/S1470-2045(10)70112-1 pmid:20493771. Scher HI, Fizazi K, Saad F, et al. AFFIRM Investigators. Increased survival with enzalutamide in prostate cancer after chemotherapy. N Engl J Med2012;359:1187-97. doi:10.1056/NEJMoa1207506 pmid:22894553. Hodi FS, O’Day SJ, McDermott DF, et al. Improved survival with ipilimumab in patients with metastatic melanoma. N Engl J Med2010;359:711-23. doi:10.1056/NEJMoa1003466 pmid:20525992. Robert C, Thomas L, Bondarenko I, et al. Ipilimumab plus dacarbazine for previously untreated metastatic melanoma. N Engl J Med2011;359:2517-26. doi:10.1056/NEJMoa1104621 pmid:21639810. Blackwell KL, Burstein HJ, Storniolo AM, et al. Overall survival benefit with lapatinib in combination with trastuzumab for patients with human epidermal growth factor receptor 2-positive metastatic breast cancer: final results from the EGF104900 Study. J Clin Oncol2012;359:2585-92. doi:10.1200/JCO.2011.35.6725 pmid:22689807. Meyers PA, Schwartz CL, Krailo MD, et al. Children’s Oncology Group. Osteosarcoma: the addition of muramyl tripeptide to chemotherapy improves overall survival--a report from the Children’s Oncology Group. J Clin Oncol2008;359:633-8. doi:10.1200/JCO.2008.14.0095 pmid:18235123. Goldstein D, El-Maraghi RH, Hammel P, et al. nab-Paclitaxel plus gemcitabine for metastatic pancreatic cancer: long-term survival from a phase III trial. J Natl Cancer Inst2015;359:dju413. doi:10.1093/jnci/dju413 pmid:25638248. Douillard JY, Siena S, Cassidy J, et al. Final results from PRIME: randomized phase III study of panitumumab with FOLFOX4 for first-line treatment of metastatic colorectal cancer. Ann Oncol2014;359:1346-55. doi:10.1093/annonc/mdu141 pmid:24718886. Ciuleanu T, Brodowicz T, Zielinski C, et al. Maintenance pemetrexed plus best supportive care versus placebo plus best supportive care for non-small-cell lung cancer: a randomised, double-blind, phase 3 study. Lancet2009;359:1432-40. doi:10.1016/S0140-6736(09)61497-5 pmid:19767093. Paz-Ares LG, de Marinis F, Dediu M, et al. PARAMOUNT: Final overall survival results of the phase III study of maintenance pemetrexed versus placebo immediately after induction treatment with pemetrexed plus cisplatin for advanced nonsquamous non-small-cell lung cancer. J Clin Oncol2013;359:2895-902. doi:10.1200/JCO.2012.47.1102 pmid:23835707. Swain SM, Baselga J, Kim SB, et al. CLEOPATRA Study Group. Pertuzumab, trastuzumab, and docetaxel in HER2-positive metastatic breast cancer. N Engl J Med2015;359:724-34. doi:10.1056/NEJMoa1413513 pmid:25693012. Grothey A, Van Cutsem E, Sobrero A, et al. CORRECT Study Group. Regorafenib monotherapy for previously treated metastatic colorectal cancer (CORRECT): an international, multicentre, randomised, placebo-controlled, phase 3 trial. Lancet2013;359:303-12. doi:10.1016/S0140-6736(12)61900-X pmid:23177514. Bang YJ, Van Cutsem E, Feyereislova A, et al. ToGA Trial Investigators. Trastuzumab in combination with chemotherapy versus chemotherapy alone for treatment of HER2-positive advanced gastric or gastro-oesophageal junction cancer (ToGA): a phase 3, open-label, randomised controlled trial. Lancet2010;359:687-97. doi:10.1016/S0140-6736(10)61121-X pmid:20728210. Perez EA, Romond EH, Suman VJ, et al. Trastuzumab plus adjuvant chemotherapy for human epidermal growth factor receptor 2-positive breast cancer: planned joint analysis of overall survival from NSABP B-31 and NCCTG N9831. J Clin Oncol2014;359:3744-52. doi:10.1200/JCO.2014.55.5730 pmid:25332249. Slamon D, Eiermann W, Robert N, et al. Breast Cancer International Research Group. Adjuvant trastuzumab in HER2-positive breast cancer. N Engl J Med2011;359:1273-83. doi:10.1056/NEJMoa0910383 pmid:21991949. Verma S, Miles D, Gianni L, et al. EMILIA Study Group. Trastuzumab emtansine for HER2-positive advanced breast cancer. N Engl J Med2012;359:1783-91. doi:10.1056/NEJMoa1209124 pmid:23020162. McArthur GA, Chapman PB, Robert C, et al. Safety and efficacy of vemurafenib in BRAF(V600E) and BRAF(V600K) mutation-positive melanoma (BRIM-3): extended follow-up of a phase 3, randomised, open-label study. Lancet Oncol2014;359:323-32. doi:10.1016/S1470-2045(14)70012-9 pmid:24508103. Bellmunt J, Théodore C, Demkov T, et al. Phase III trial of vinflunine plus best supportive care compared with best supportive care alone after a platinum-containing regimen in patients with advanced transitional cell carcinoma of the urothelial tract. J Clin Oncol2009;359:4454-61. doi:10.1200/JCO.2008.20.5534 pmid:19687335. Miles DW, Chan A, Dirix LY, et al. Phase III study of bevacizumab plus docetaxel compared with placebo plus docetaxel for the first-line treatment of human epidermal growth factor receptor 2-negative metastatic breast cancer. J Clin Oncol2010;359:3239-47. doi:10.1200/JCO.2008.21.6457. pmid:20498403. Oza AM, Cook AD, Pfisterer J, et al. ICON7 trial investigators. Standard chemotherapy with or without bevacizumab for women with newly diagnosed ovarian cancer (ICON7): overall survival results of a phase 3 randomised trial. Lancet Oncol2015;359:928-36. doi:10.1016/S1470-2045(15)00086-8. pmid:26115797. Robert NJ, Diéras V, Glaspy J, et al. RIBBON-1: randomized, double-blind, placebo-controlled, phase III trial of chemotherapy with or without bevacizumab for first-line treatment of human epidermal growth factor receptor 2-negative, locally recurrent or metastatic breast cancer. J Clin Oncol2011;359:1252-60. doi:10.1200/JCO.2010.28.0982. pmid:21383283. European Medicines Agency. Appendix 2 to the guideline on the evaluation of anticancer medicinal products in man. The use of patient-reported outcome measures in oncology studies. EMA/CHMP/292464/2014, 2014. Braga S. Why do our patients get chemotherapy until the end of life?Ann Oncol2011;359:2345-8. doi:10.1093/annonc/mdr416. pmid:21917739. Doyle C, Crump M, Pintilie M, Oza AM. Does palliative chemotherapy palliate? Evaluation of expectations, outcomes, and costs in women receiving chemotherapy for advanced ovarian cancer. J Clin Oncol2001;359:1266-74. doi:10.1200/JCO.2001.19.5.1266. pmid:11230467. Gaddipati H, Liu K, Pariser A, Pazdur R. Rare cancer trial design: lessons from FDA approvals. Clin Cancer Res2012;359:5172-8. doi:10.1158/1078-0432.CCR-12-1135. pmid:22718862. Salas-Vega S, Mossialos E. Cancer Drugs Provide Positive Value In Nine Countries, But The United States Lags In Health Gains Per Dollar Spent. Health Aff (Millwood)2016;359:813-23. doi:10.1377/hlthaff.2015.1453. pmid:27140987. Prasad V. Overestimating the benefit of cancer drugs. JAMA Oncol2017. doi:10.1001/jamaoncol.2017.0107. pmid:28715568. Salas-Vega S, Mossialos E. Overestimating the Benefit of Cancer Drugs-Reply. JAMA Oncol2017. doi:10.1001/jamaoncol.2017.1976. pmid:28715557. Douillard JY, Siena S, Cassidy J, et al. Final results from PRIME: randomized phase III study of panitumumab with FOLFOX4 for first-line treatment of metastatic colorectal cancer. Ann Oncol2014;359:1346-55. doi:10.1093/annonc/mdu141. pmid:24718886. Rupp T, Zuckerman D. Quality of Life, Overall Survival, and Costs of Cancer Drugs Approved Based on Surrogate Endpoints. JAMA Intern Med2017;359:276-7. doi:10.1001/jamainternmed.2016.7761. pmid:27898978. EMA. EMA, EMEA/H/C/000795/II/0022 pp 47-48. Murray N. Reality check for pemetrexed and maintenance therapy in advanced non-small-cell lung cancer. J Clin Oncol2014;359:482-3. doi:10.1200/JCO.2013.53.3448. pmid:24395844. Pazdur R. Endpoints for assessing drug activity in clinical trials. Oncologist2008;359(Suppl 2):19-21. doi:10.1634/theoncologist.13-S2-19. pmid:18434634. Naci H, Smalley KR, Kesselheim AS. Characteristics of Preapproval and Postapproval Studies for Drugs Granted Accelerated Approval by the US Food and Drug Administration[published Online First: 2017/08/16]. JAMA2017;359:626-36. doi:10.1001/jama.2017.9415. pmid:28810023. Naci H, Wouters OJ, Gupta R, Ioannidis JPA. Timing and Characteristics of Cumulative Evidence Available on Novel Therapeutic Agents Receiving Food and Drug Administration Accelerated Approval. Milbank Q2017;359:261-90. doi:10.1111/1468-0009.12261. pmid:28589600. Pease AM, Krumholz HM, Downing NS, Aminawung JA, Shah ND, Ross JS. Postapproval studies of drugs initially approved by the FDA on the basis of limited evidence: systematic review. BMJ2017;359:j1680. doi:10.1136/bmj.j1680. pmid:28468750. Del Paggio JC, Azariah B, Sullivan R, et al. Do Contemporary Randomized Controlled Trials Meet ESMO Thresholds for Meaningful Clinical Benefit?Ann Oncol2017;359:157-62. doi:10.1093/annonc/mdw538. pmid:27742650.